I’m not even sure if they’re even remotely related to ox, but Mt. Talamitam at Bgy. Bayabasan, Nasugbu, Batangas sure has its share of cows though there weren’t as many as the ones we encountered 2 years ago when we greeted the Year of the Pig. Still it was an apt replacement for Bato-bato Peak (Mt. Lobo) which was our original choice. I don’t mind climbing the same mountain twice. It is more enjoyable as there are no anxieties about the trail and the camp site and expectation are low. My first climb at Talamitam was peppered with cows and a relentless sun that threatened to dry-up every last drop of water in our sweaty bodies. All I had in my mind was to just keep on going and going until the campsite at the summit. Four of us had gone ahead of the pack and we had taken the really steep trail not knowing that an easier one was just a couple of hundred meters away. Up at the bare summit in the middle of the afternoon with nothing but cogon , the view did nothing to soothe my aching legs and my thirsty throat. This time, the challenge of Talamitam was different. It had nothing to do with the mountain but everything to do with me. Since November, my right knee has been bothering me, preventing me from doing any cardio workout that involves knee flexion. Even the stationary bike is painful. The result is weight gain plus a not too strong lower body and of course, a compromised cardiovascular system. I was afraid that any trail would be too punishing for my knee. But more challenging was my recent and quite frequent “episodes” which landed me at the ER Friday of last week. Friends and the internet say the symptoms seem like those of an anxiety attack. My blood test results I got just this Friday cleared me of low hemoglobin (which the ER doctor suspected) and high cholesterol (which I suspected). I still have to get my ECG tomorrow. I should probably have more tests and visits to the doctor but as of this moment, I diagnose my episodes as anxiety attacks. I had already ruled-out vertigo as I don’t have any spinning sensation. What I get is a tightening of the head, a feeling of uneasiness and nervousness, and generally uncomfortable and queasy feeling. They seem to occur when I feel the light is too dim, I stare at the computer too long or there are too many people. But when I start taking slow and deep breathes and tiled my head forward to stretch the back of my neck or look away, I calm down and the symptoms disappear. Friday night, all packed and ready to go, I still wasn’t sure I was confident enough. I conferred with Ari and he advised me to go if I’m not climbing alone and to make sure I had someone with me at all time and not to fall when an episode occurred. Deep inside me, I wanted so much to go to my climb as I knew if I missed this one, I would probably miss other climbs due not so much to my condition but the crippling fear and lack of confidence it brings. No way was I gonna let this drown-out my passion. After all, if it were really anxiety attacks due to supressed stress as Ferdie and Regina suggest, it wasn’t organic but pyschological. I knew I could pysche myself out on this one. I got a confidence boost when Elf, another doctor, said that all indications point to what I think it was. So there I was mid-morning with 20 other people, whiling away the time eating buko at Mang Nick’s spacious backyard at Bgy. Bayabasan. Same Mountain. So Many Changes. So much had changed in Talamitam. Some controversy in the registration had the baranggay yanking registration rights from Mang Nick to someone else. But people still go to Mang Nick and his wife, Ate Tess for information and to stay at their place. Who wouldn’t, they are as accomodating and entertaining as ever. They remember each and every mountaineering group who stay with them even if it’s just to ask for directions, rest at their hut, or use the toilet. Our G4M banner was still waving happily in the wind, tacked to his hut which he converted to his wood sculpting workshop. Newer streamers and even a couple of shirts had also joined in. Proof that Mang Nick is as popular as ever. Fortunately, when we started the hike at about 3, it was very cloudy which made for a pleasant walk and in an about an hour, we made camp at the shoulder. Behind us, the summit loomed high and opposite was the undulating peaks of Mt. Batulao. With so many others having gone before us, we decided that we were better off here than at the summit jostling for tent and socials space. It was a really good idea as later on in the evening, the winds really rose and I couldn’t imagine how horrible they would be at the summit. If it were a typhoon, it would have been a signal no 3 or even a4. It was really cold and the winds were really strong coming from all sides. Trojan1 and I had to relocate our tent and put guylines on the flysheet as our tent was being flattened. It was an unusually quiet socials night with people off to bed early and only a few breaking the midnight mark. And even more strange, there were still 3 unopened GSM Blue bottles. Hmmm…..
Not sure if I could hold-up my morning toilet call (I did), I didn’t summit. Those who did report wider trails and newer criss-crossing ones. Farmlands have also crept nearer the slopes to the summit. We were back at Mang Nick’s around 11. I just stayed long enough to have some fresh buko and wash-up a bit. Not wanting to be in the middle of the Sunday Tagaytay rush-hour traffic and cramped bus space, Trojan1, DanDean, and I went ahead. I was back home at shittyland around 2. I had left my knee support (first time I ever wore one to a climb) and my TNF jacket behind. Fortunately, someone kept it for me. My left calf was sending distress signals already. “I’m gonna Take 5 on the next step,” I promised myself. But each succeeding step only brought me higher and higher with no place to rest my aching legs and feet. The incline was about 80 degrees and my backpack was feeling heavier and heavier. There was nobody else I could see. The cogon grasses were so tall that I was literally dwarfed by them blocking any view. Before me was just the steep trail and nothing else. I couldn’t even see where the trail was leading to. The sun beat mercilessly on my back. I never felt so alone and so tired. Afraid of losing momentum or my drive to make it to the top, I pushed on and on. Suddenly, as I reached forward to grab hold of some cogon and took a big step up, I emerged on a small clearing. The 4 climbers I had seen from the meadow making their way up were there enjoying their meal. The 360 degree view was breathtaking—the surrounding mountains, the bay, and the farmlands below. I had made it to the summit of Mt. Talamitam. Rising more than 700 m above sea level, Mt. Talamitam earned its name from the talamitam that used to grow abundantly on its slopes. Today, the mountain is largely covered with cogon grass from the shoulder all the way to the peak. There are no trees in sight and is literally open field. 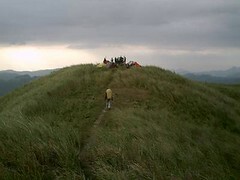 Popular among mountaineers due to its low elevation and manageable trails, it is easily accessible and “guarded” by Mang Nicky who takes charge at the jump-off point. We arrived in Bgy. Bayabasan and Mang Nick’s place at about 10am. After cooling our heels in the small hut, gathering some green mangoes that Oyo had taken from the tree, and our pictures taken, we finally set off with Mang Nick’s orientation ringing in our ears. Rex got 2 “sherpas” to carry his load and serve as guides, too. About 20 minutes later, we were by the river and decided to have lunch there as the sun was really heating-up the day. I ate my sandwhiches, had some fresh buko and a shot of Granma. We resumed the trekk at almost 2pm. At the lead was Oyo, Allan, and me. Eventually, the group split in two with the three of us forging ahead as it was really getting so hot and we just wanted to keep going and going. 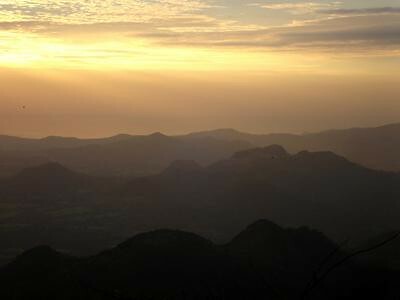 Talamitam is classified as an easy t0 moderate climb. The trail is easy to follow. It starts at the forest then passes through several farm lands guarded by grazing cows until it ends on wide open field which is the mountain’s shoulder. From then on, there is little shade for one to stop and take a break. There were so many cows grazing that I let Oyo go before me as they didn’t look too welcoming. I had read of other mountaineers’ comments of being chased by cows and I didnt’ want to add to their stories. Whenever I would pass by a cow I would walk hurriedly and try not to catch the cow’s attention. Hahahaha. Emerging on to the shoulder of the mountain, the summit towered ahead. The day was so clear and the sun shining so brightly, we could see the trail and the small group ahead of us climbing their way up. The trail looked like one long vertical line going all the way up. One cow with horns blocked the trail leading to the base of the summit so we had to make a detour. Eventually I eneded-up in front with Allan behind me. Because the guides were with the others and the three of us were just following the trail the group before us were using, we didn’t notice nor did we know that there was actually an easier trail—not steep but winding slowly up. Well, I did notice there were two openings on the cogon grass and I decided to take the left one. Bad choice. It was the road less travelled by and it really made all the difference. This was the difficult trail. It just kept going up and up and up. Near mid-point, I was grabbing on to the cogon grass already to help pull myself up and while I was almost hugging the ground just to keep me steady. I could hear my heart pounding as I tried to control my breathing. The ground was so dry and it was really really hot. When I finally reached the top, the sun was in full force and there wasn’t a tree in sight. My tent was with Oyo so I had nothing to cover myself with. Thank god it was really windy so it helped ease the heat. Oyo and Allan arrived around 10 minutes later while I took a nap on the clearing. Several minutes later, the others arrived. Turns out, they set-up a mini-camp somewhere and waited for the sun to abate a bit. Plus, they took the easy trail which the guides showed them. When they were arriving I was actually wondering why they were coming from a different direction and we could actually see them from the peak. No one can make camping with as much fun and style as a group of faggots. We were about 20 plus and had 9 tents. 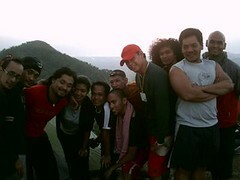 Of course, photo ops were not to be lost as there was a 360 degree view of the surrounding mountains such as Batulao. The sunset was maginificent as it painted the clouds a shining palette of colors. In the evening, we could even see the lights of Makati! Yes, we went all the way to Nasugbu, climbed 700 plus meters above sea level just to get a view of Makati from the distance. Because it was Kung Hei Fat Choi, dinner was special. We had pasta with vodka sauce, pita bread wraps, prawn beryani, beef strips with red pepper and black-bean sauce, kikkoman beef with bell peppers and pineapples, stir-fried baguio beans, tonkatsu, fresh tomyang salad, adobo in different versions, plus various packed dinners. There was Tequila and the never-absent Granma for socials. With sweets packed in miniature gold-colored plastic pigs and fortune cookies, it was a gastronomic greeting to the Year of the Fire Pig. We ended the socials past 12 already. By then, the wind was picking-up and Oyo and I had to change the position of our tent and remove the rain sheet to keep it from being blown away. It was really really really cold, too. The sunset was gorgeous. 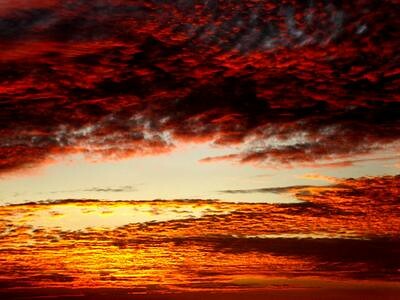 The sky was painted a glorious crimson and red. The wind was chillingly cold and strong but we didn’t mind as we were surrounded by colors. It was awe-inspiring to say the least. In the evening, we could see the lights of Makati and at midnight, at the distance, fireworks lit up in the sky. We broke camp about 10 am and headed back to the jump-off point via the easy trail where more buko and lunch waited for us. I didn’t see any cows this time. Maybe they were resting coz it was Sunday. Hahahha. We had made arrangements with the guides to cook lunch for us and we had pork chops, tinola, and green mangoes plus halo-halo to cool-off the sweltering heat. It was such a relief to finally shower-off all that dust. Displayed on the small hut were banners from other mountaineering groups, and we added ours. We walked up to the highway for a jeep to Tagaytay while the others went back to Manila. We went down at RSM and ate again. The food was over-priced and so-so. Well, it is Tagaytay after all where you pay for the mountain air and the view, rather than for the food. Then it was back home. This was my first climb after a year of being stuck in the urban jungle. So when Guys4Mountains announced a Chinese New Year climb, I signed-up and announced to everyone I work with that no one should dare interfere with my Feb 17-18 schedule. I had missed so many climb because of last-minute engagements that I was really bent on pushing through with this. There’s nothing like being outdoors and going through the mental and physical challenge of climbing to bring people together. The common hardships you face and the common rewards you receive make an indelible impression which binds you to everyone else. 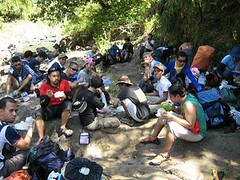 My last climb with the group was at Gulugod Baboy February last year and yet I felt as if I had not been away too long. 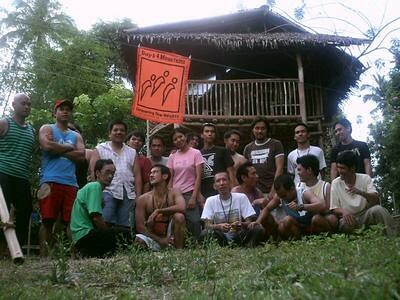 There were familiar faces like those of Bench, Jck, Bluefair Guy, Noey, Mariano, Elf and new ones like Trojan5, Josevilla. The smiles were as brilliant and the laughter as cheerful as I first remember them. It is said that greeting the new lunar year in an elevated place brings good luck. In the evening, gazing at the star-lit sky, I felt so lucky to be in such a place and experience the infite wonder of creation. 1. Buy a better cook set. One that at least has a pan deep enough to steam dumplings with (which was my baon). 2. Chopsticks make great cooking utensils—light and easy to carry. 3. Never under-estimate your need for water. I only brought 3.5 liters with me and ended-up asking the guide (who was coming back the next day) to buy some water for me. 4. Reserve instant food for breakfast. Faggots’ contribution to mountaineering is gourmet food cooked, served, and eaten hundred of meters above sea level. Leave the adobo, maling, and sardines to the straights. 5. Make sure your socks reach the level of your trekking boots.